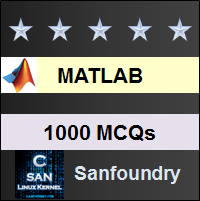 This set of MATLAB Multiple Choice Questions & Answers (MCQs) focuses on “Linear Systems”. 1. What is a linear system? HOMOGENITY: For input ax1(t), output should be ay1(t) and for input bx2(t), output should be by2(t). Finally, if for an input of the sum of ax1(t) and bx2(t), if we get the output as sum of ay1(t) and by2(t) the system is both homogeneous and additive. This is similar to the superposition principle. No the system is linear. 2. What is the output if the following code? Explanation: The syntax of the if control structure is wrong. While writing the logical expression, we cannot put it under brackets. If the brackets were removed, True would have been displayed. Explanation: If the system of equations is not consistent, the student cannot ever get a solution for the system of equation. He has to check consistency by finding the rank of the matrix. Thereafter he can comment on the nature of solutions the system possesses. Explanation: The in-built function to find the eigen values of any matrix in MATLAB is eig(a). But, to display the result in matrix form- we use eig(a,’matrix’). This nature of the eig command is in-built in MATLAB. Explanation: The eig(a,’matrix’) command will return the eigen values of the matrix ‘a’ in a matrix form. But, it will give it in an unsorted manner- the elements will be placed on the principal diagonal. To sort them, we need to use the sort command- this will sort the columns in ascending order. Explanation: First we need to check if the system is represented by a set of equations or it is represented in terms of signals. If it is represented by a set of equation, we need to go for homogeneity first. If it is represented by the observation of input-output signals, we need to go by Superposition. 7. In MATLAB, how can we check linearity of systems represented by transfer function? Explanation: Since we have the transfer function of a system, we need to apply superposition and compare the waveforms generated after applying the method of superposition. Rouche’s Theorem is for a system of equations represented by matrices and it is the method of comparing ranks. 8. How can we check in MATLAB if an electrical circuit is linear or not? Explanation: We can model our circuit in Simulink and then apply the superposition theorem to check if at all the circuit is following superposition theorem. To apply the theorem, find the I/V relationship across any branch due to a single source and switch of the rest of the sources. Repeat this process for all the individual sources. Finally, turn on all the sources and check whether the I/V relationship is equal to the superposition of all the I/V sources previously calculated. 9. How can we find the solution of a nonhomogeneous system of equations without dealing with the rank of matrices? Explanation: It is easier to find the solution of a system of equations for a non-homogeneous system using Cramer’s rule. Now, the process is time consuming since we need to find higher order determinants for higher order systems. This is why we go for Rouche’s theorem by hand. But MATLAB computes determinants very fast. Hence, without finding the rank, we can find the solution of a system of nonhomogeneous equations. 10. For a homogeneous system, Cramer’s rule will always yield a trivial solution in MATLAB. Explanation: The process of Cramer’s rule will always yield a solution for the variables in a system. But for a homogeneous system with no constant value, it will yield a 0 as a solution. Hence all the variables will get a 0 as a solution, there-by yielding a trivial solution. This doesn’t imply that the system is inconsistent- this is why we go for comparing ranks, it will allow us to establish a more pertinent justification of the nature of the system. Explanation: If the determinant of co-efficient matrix is 0, all the solutions will come to be Infinite. Thus, this is the condition to check before going for Cramer’s rule to check the solution of any system of equations. Explanation: Superposition will definitely fail in presence of active elements. A system containing only passive elements will always follow superposition. Superposition theorem fails for unilateral elements., the network must have only passive elements. 13. A second order system with no initial condition is always linear. Explanation: The superposition theorem will yield the nature of linearity of a system. For a system defined by an n-th order differential equation, if there are no initial conditions- the system will always be linear. Explanation: Since the matrix is non-singular, the rank is the highest number of rows or columns (both are the same for a square matrix. Since we know the matrix is non-singular, we don’t have to use any command. We can directly say the rank is equal to the order of the matrix. If the matrix is not singular, we will have to use rank() to get a value of the rank. X is the matrix created by replacing a column with constant co-efficients in the equation. Is this a proper justification? Explanation: The code should have been p=X./C. Since the system is homogeneous, X is always 0. So, applying Cramer’s rule will always yield a trivial solution. But here the student gets or ‘Inf’ as an answer since according to his code, C will be divided by 0- this isn’t really the case. Hence, this is not a proper justification.